July is sarcoma awareness month so I’ve invited others affected by sarcoma to guest blog throughout the month. 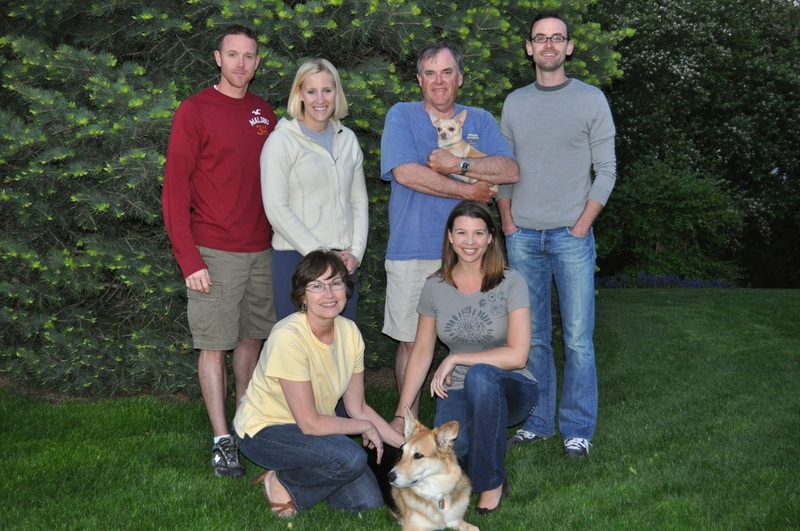 Today’s blog comes from Suzanne Burkhart, wife to a sarcoma angel, Jim Burkhart. 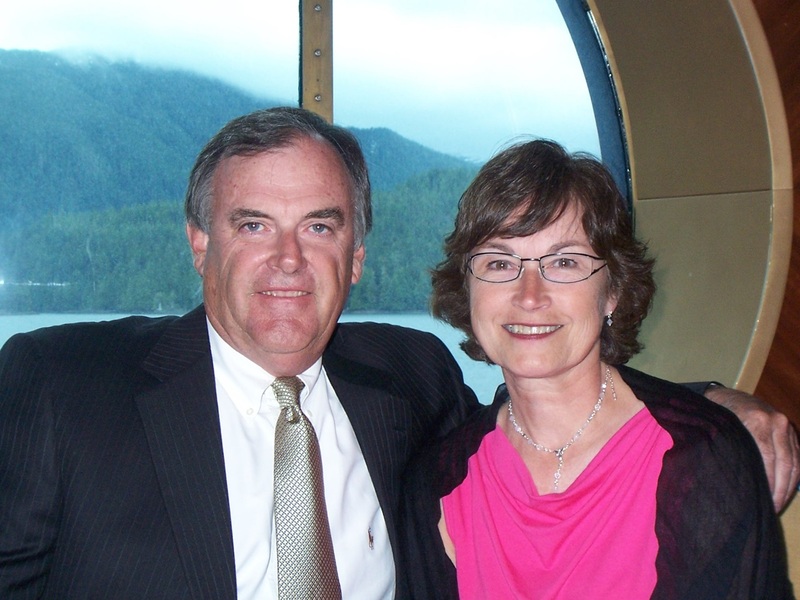 When my husband Jim told me he had Sarcoma, I looked at him and said “Are you sure the doctor didn’t say ‘Carcinoma’”? “No, the doctor said Spindle Cell Sarcoma”. Sarcoma, what was that word? Our journey began before the “Sarcoma” word. 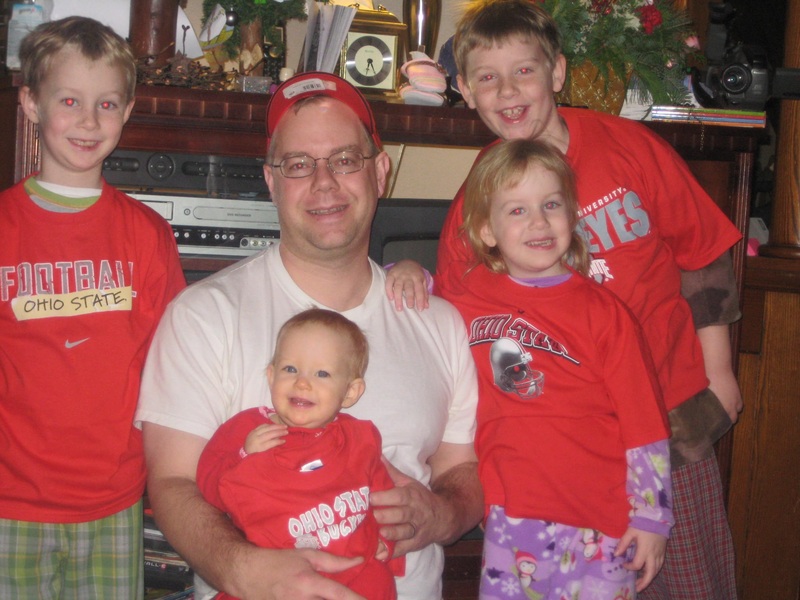 In January of 2011, my husband Jim was watching one of many bowl games when he felt a lump on the back of his leg. He pushed on it and immediately pain shot down to his foot. He kept that information to himself. A few weeks later, I walked into our bedroom to see Jim stretching out his leg. I asked what he was doing and he replied “I think I tore a muscle, so just stretching my leg”. I suggested physical therapy. The physical therapist said he would not touch Jim until he had an MRI. That MRI led him to surgery for a biopsy. 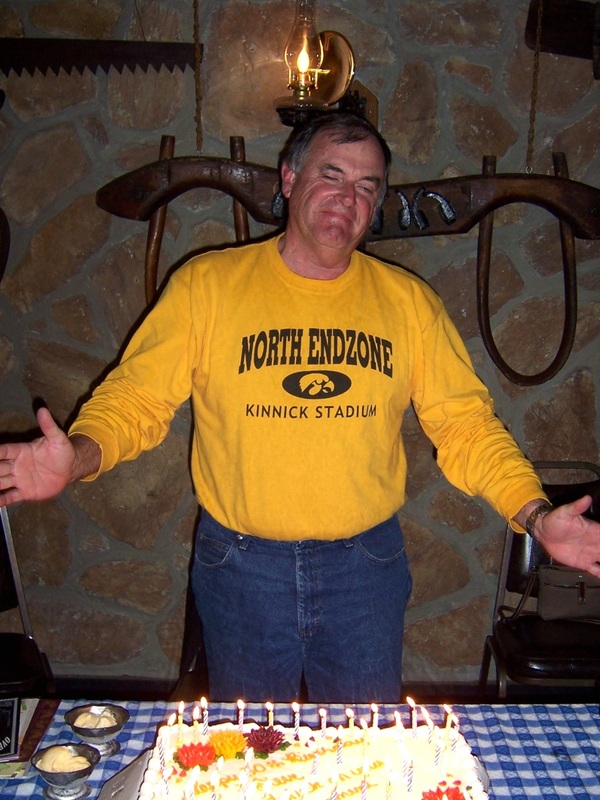 Right before Easter of 2011 Jim was told the dreaded news – Spindle Cell Sarcoma and an appointment was scheduled for the Monday after Easter at the University of Iowa. We met with Dr. Joseph Buckwalter and he explained more about sarcoma, but your mind is a whirl and you don’t fully comprehend. Jim was scheduled for surgery that Friday in hopes to clean up the tumor, to get a full understanding of what we were dealing with. Friday’s surgery came and after surgery, Dr. Buckwalter told me that in order to save Jim’s life, he would have to amputate the left leg. I cried….whatever else was said I don’t remember other than those words “we are going to have to amputate”. We went home to tell our children. Sam was 9, Henry 8, Eleanor 5 and Charlotte had just turned two. How do you find the words to tell your kids that their world was going to change, that their dad was going to look different. Our family cried, the boys begged for it to not happen, that they would be better behaved, we prayed. We went back to Dr. Buckwalter to discuss the amputation. Due to scheduling conflicts (ours because we wanted to wait until after our son’s First Communion) we met with Dr. Ben Miller. We really felt at ease with Dr. Miller. Dr. Buckwalter was a very good doctor, but at the time, I was very angry with Dr. Buckwalter for the news he had delivered. Surgery was scheduled for May 20- Jim and my 11th wedding anniversary. For me, what better day, since I promised Jim, in sickness and in health. This is how it is with Mo. Our lives were up and down and he was the steady in our tumultuous waters. We went for a second opinion in New York and came back to Mo with our findings. We went to NIH (National Institutes of Health) with Mo’s blessing for Jim to be in yet another clinical trial. We always pushed Mo and he pushed further and harder for Jim. In March of this year, Jim had a gall bladder attack. With everything he had going on, a gall bladder attack seemed minor. We had our local doctors make contact with Iowa on how to treat. A week off of treatment and Jim had his gall bladder removed. Another week off of treatment and Jim was chomping at the bit to get back on treatment. Mo agreed. At our next appointment, we were told that the tumors in Jim’s lungs were still growing but, in true Mo style, he had one more thing to try, but this was it. If this treatment didn’t work, than he has exhausted all his resources. Early in the morning of May 16th, Jim called out for me. I ran to him and he was struggling to breathe. We had an appointment later that morning in Iowa but I said to him, “Babe, I think we need to go to the hospital”. He agreed. The ER doctor told me the news that I knew, dreaded to hear, but knew I had to know. “He is dying” the doctor told me. I emailed Mo, I needed him to know. Oh, how I wish he could have been there, but we were too far away. I went in and told Jim “Babe, I think we are getting to end of our journey here”. We cried. I went to get our kids…family and friends gathered. By 10:15 that morning, my Jim was gone but I knew he was at peace. The next morning I again emailed Mo. I thanked him for giving Jim three more years he may not have had. I told Mo to keep doing what he was doing…fighting for his patients in their battles against Sarcoma. 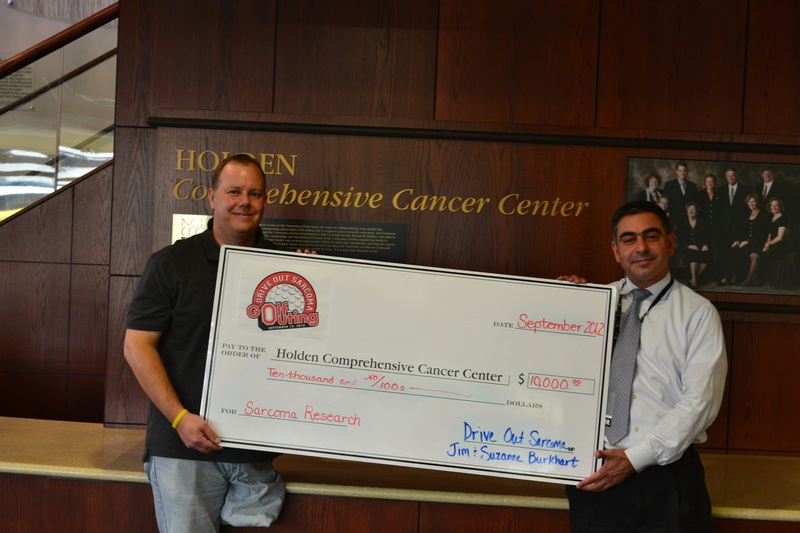 And on our end, we will continue to keep doing what we have done for two years…raising much needed funds for Sarcoma Research through Drive Out Sarcoma. I leave you all with this. Jim never complained, not about treatment, not about why he had cancer. He accepted his fate and trusted in Mo to help him. He also had a strong faith in God to help him through diagnosis, treatment and death. While the kids and I will miss Jim every day of our lives, we know he is at peace. Cheers and Have a Wonderful Life! Since May is Melanoma Awareness Month, I’ve invited others affected by melanoma to guest blog on the 7th, 14th and the 21st. I’ll wrap up the month by blogging again on the 28th. Today’s blog is written by Brett Yates. Enjoy. We’ve all been conditioned to get our regular checkups, right? A physical every year. A dental cleaning twice a year. We even get the car oil changed every 3 months. Why isn’t a skin cancer screening on that list of necessities we take care of each year? It should be. We had known that its return was possible for years, but if I’m honest I wasn’t considering it seriously. 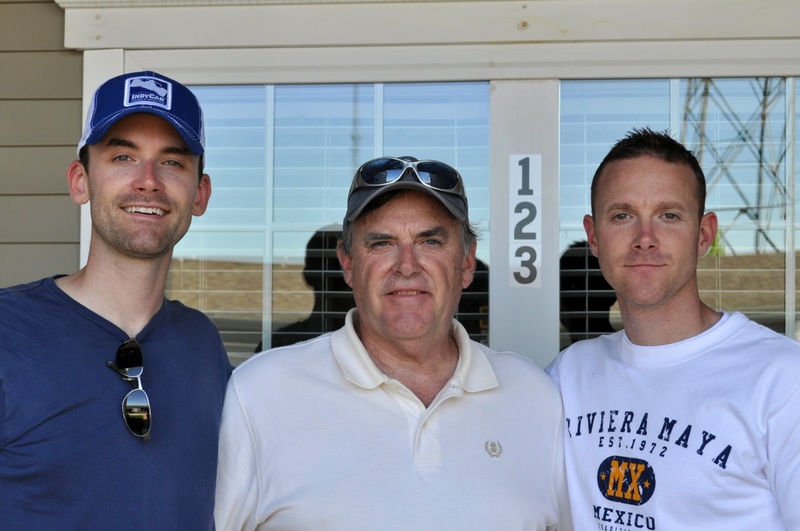 So, on January 31, 2011, it was with great surprise and shock we learned that my father’s melanoma had spread. 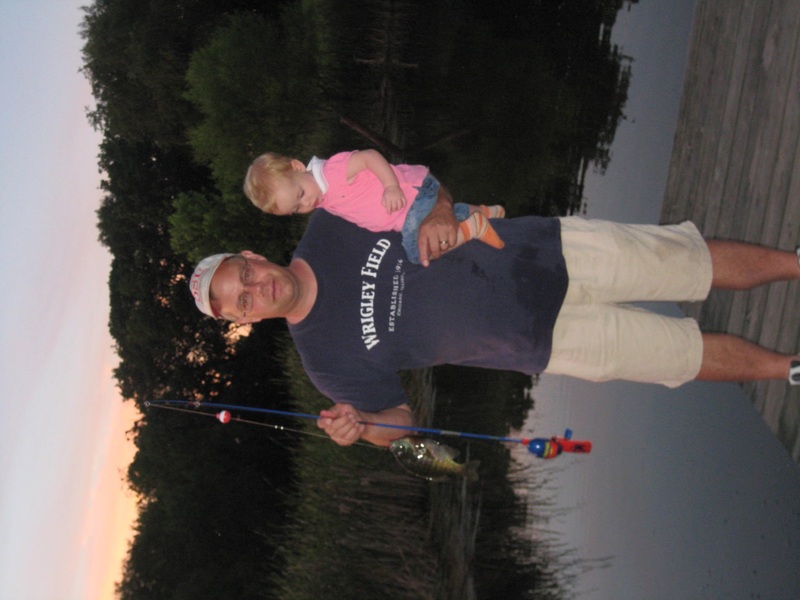 Dad was first diagnosed with melanoma in 2007 when a tumor was found growing on his shoulder. It was surgically removed and he hoped that would be the last he would hear of it. It returned 3 years later and was again surgically removed. But this time it stuck around. Tumors were discovered in his liver, lungs, spinal cord, and brain. From the time of Dad’s original melanoma diagnosis in 2007 to the end of 2010 before his tumor metastasized, his life was fairly normal. He was getting checked regularly and doing everything a person with a melanoma diagnosis should do. However, once the cancer spread, it did so with a vengeance. We had less than 3 months with him after the stage IV diagnosis. 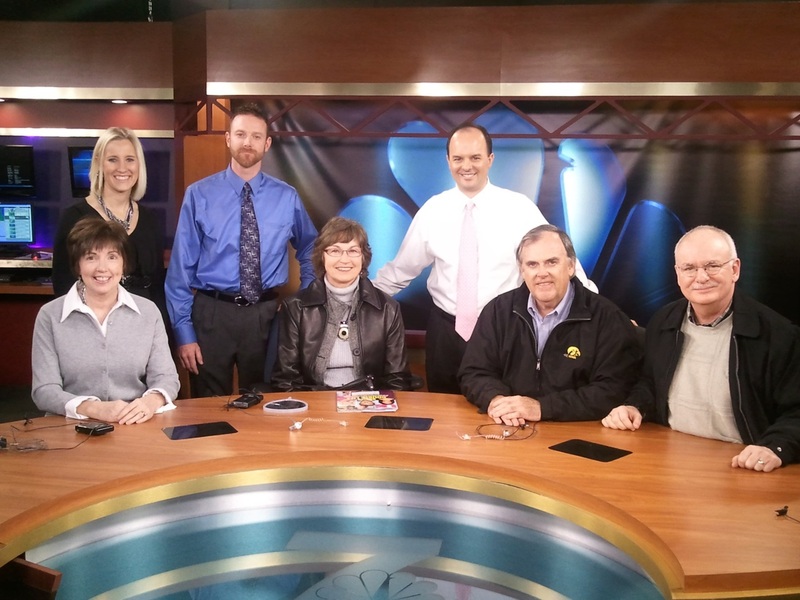 “I remember Dad had wanted to go down to the KWWL studios for quite some time for a tour and we finally got it scheduled. It just so happened to fall on Valentine’s Day 2011. We made an evening of it and surprised him before we went out to eat. He had no idea that we had been planning it. He was very surprised. He got to meet the whole group and even got to sit in Ron’s chair. I’m forever grateful to Mark [Schnackenberg], more than he’ll ever know, for being so generous in allowing us to come for a tour and even hang out for both of the evening newscasts. To give you an idea of who my father was, what his effect on the world was, I need only tell you about his visitation. I stood for nearly 4 hours greeting a line of people wrapped around the block who had come to pay their respects. Many waited in line for an hour and a half before reaching the visitation room. My father had an effect on people the extent of which I hadn’t truly known until that visitation. He had a quiet emotion that was often hidden behind his strong, boisterous personality. I think that is what endeared him to so many people. He loved life so clearly and loved the company of others. It’s that effect on people we should all strive to replicate. And if we’re lucky, maybe we’ll have the same turnout when it’s our time. Playing golf was one of Dad’s favorite pastimes, so every year around the anniversary of his death, we gather to celebrate his life over a round of golf with the goal to raise money for research and awareness of melanoma. 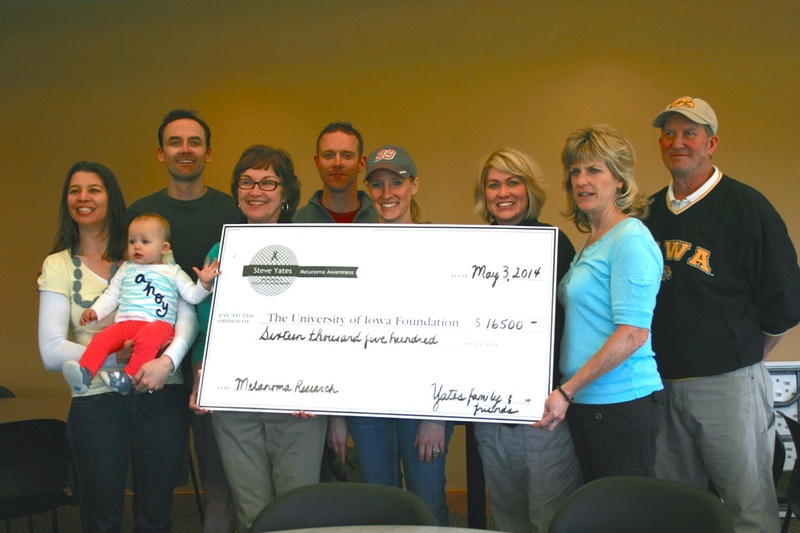 To date, and with the help of everyone who participates and donates, the tournament has raised over $50,000 for research being done by Dr. Mo and his team at the University of Iowa. Why does God allow disasters to happen? Is He punishing us? The Bible does not give an adequate explanation for disasters any more than it can for diseases such as cancer. There are times when no answers will do. There are times when nothing else will do except we roll up our sleeves and pitch in to do whatever we can to reverse the bad fortune of the moment. We’re hoping to do the golf tournament each year to continue the fight against this terrible disease. We would love to get more people involved. If you’ve been affected by melanoma in some way, maybe you have a family member who has died, maybe you’ve survived melanoma yourself, or maybe you just want to be involved, we’d love to hear from you. This past year, Molly Menard, who wrote last week’s post, was there with doctors from Iowa City who volunteered their time for free skin cancer screenings. Those screenings may have saved someone’s life! Let’s work together to end this disease. We’d love to acknowledge you and your family at the event. We’ll even change the name of the tournament to the Iowa Melanoma Golf Tournament (or something more catchy :)) if more families join the cause. You can learn more about the tournament at www.steveyatesmelanomaawareness.org. I’ll leave you with words from Dad himself. Quoted below is an email he sent to his colleagues at John Deere upon his retirement. It is surprisingly appropriate, especially if you think of his retiring not just from 31 years of work, but from 63 years of life. “Well my time has come. It’s time to hit the send button on this last e-mail. Well, for me…what they say is true. I wish each of you all the best in the years to come, both within John Deere and personally. I’ve enjoyed working with…and knowing…all of you. God’s rich blessings and best wishes to each of you. If you need a 4th to complete a foursome sometime…give me a call. It is hidden, and it is beautiful. It is like a veil that conceals but it is a phenomenon worth watching. Over time we have come to understand how and what it is. Does this knowledge subtract from its beauty when we know the truth of what actually happens? I feel that it adds a dimension of appreciation that is not easy to explain. My team and I visited a scientist lab that transported me to new dimension a place that is foreign, different and exciting. We walked through the halls like a maze to a room. Sometimes it feels like I’m in a spaceship walking through the different passages. What I saw was new and strange. Where were the rules? Cancer has no boundaries. Ok let me stretch my mind around what I am seeing. Can I see what I am not seeing? Cancer is constantly redefining the boundaries of those past ideas that attempt to limit it. It was my first glimpse at a 3 dimensional live reconstruction of a tumor growing in a petri dish. We had grown accustomed to seeing cancer through a microscope after it had been sectioned and placed on a glass slide. This process was not 2 dimensional at all. I pushed the 3D glasses closer to my eyes as I tried to understand what it was I was looking at. Marveling at what I guess I knew all along but had not seen it to believe. This makes sense, of course it behaves this way, how else could it have behaved? It moves, it is not static, it is alive, and it evolves. It is intelligent. Even the scientist trying to explain it was searching for how to explain its unique nature. I left the lab thinking to myself that the world is now round it is no longer flat. Was I now convinced that I should change how I think about this process? I do not know how to share the beauty of a process that is too fascinating to ignore, its power lies in that which we cannot see. It is unfortunate because it involves us, humans, and makes us suffer. I look back at my clinic today and all those affected by cancer who have to face it with courage. It is in the hidden complexity, the eclipse that takes our breath away, when what is not seen is revealed. Just like the moon that shields the rays upon the sun allowing us brief moments to contemplate what an amazing natural process this truly is. Wishing you the best of holidays. I will be back blogging in a couple of weeks. ‘Til then… take care. Everyone in the room is quiet. I feel like the old man leaning forward looking through my glasses understanding the situation but not fully. As an observer I have seen it, can describe it but I am not experiencing it myself. No one in the room can appreciate that struggle. Three situations have made me think differently this week about cancer and what I do. So lets navigate the spheres of care. The psychological, the spiritual, and the physical realms that humans use to perceive their surroundings. I walk into a room and pull up a chair. I feel separated from my patient because of a new unfortunate event. I start to talk. The power of words, trying to reconnect and asking politely to let me back into their struggle. My patient said to me “Mo I can handle the pain but not the emotions of this struggle”. I acknowledge this. I do not underestimate it. Anxiety and depression makes a patient alone as if orphaned by their diagnosis struggling at their core to make sense of things. The psychological scramble. My patient sits across from me, my last one for the day I think to myself, going home soon, the day is done. Then out of the blue as I describe the cancer, I hear the words “Mo you talk about cancer very spiritually.” Revelation. Taboo, should not talk to this person about this right now, no religion allowed. That’s the training. My indoctrination. But honest that was one of the best conversations I have ever had with someone with this disease. Challenged. My patient stares at me but does not understand. Waves at me and smiles. That innocent oblivious smile. Someone else is making this decision for them. They are in pain and the people around perceive the situation but are unable to communicate it truly and fully. How can this paradox exist you might think? In a challenged intellect perhaps where explaining the physical does not help, words are of no use and an orphan appears. Three unique situations. Each one with no real guidance on how to approach them. Am I the pioneer then? Don’t want to be. But clearly we have to start thinking of this disease as different and evolve more holistic approaches to help those who it encompasses. Perhaps we have to explore it in places we dared not go before. Like orphans exploring parenthood for the first time.